First off let me say that I love Holiday World. With that said I am disappointed in Holiday World also. Holiday World is a amusement park located in Southern Indiana in the small town of Santa Clause, IN. That is not a joke that is the name of the city. It was opened in the 1946. That is just a little history very little. http://en.wikipedia.org/wiki/Holiday_World_%26_Splashin%27_Safari if you want more. As the popularity of the park grows so do the number of guest that come to visit. Which is a good thing and Holiday World has a good thing going where they try to add a new major attraction every year. They have decent rides also, you have 3 great coaster (Voyage, Raven and The Legend), you have the staple rides of any park scrambler, tilt-a-whirl, carousel, bumper cars, white water rafting ride, log flume, spider ride, antique cars, tower ride and swings. Holiday World also has Splashin’ Safari which is a great water park. I do not have any complaints about the water park I think it is GREAT. My disappointment is that the number of guest goes up but they are not really adding any other rides to accommodate. I am not talking major rides like a coaster or anything. I just think they need to add some other rides that are suited for adults. If I am correct I believe Cedar Point has more coasters than Holiday World has rides that don’t include the water park. Holiday World has more water slides in there water park than they have more rides for adults. I would like to see some additional rides added and also when it is the 2nd busiest day of the season you should probably run more than one train on your coasters. Now don’t get me wrong I love Holiday World and it is really great place to visit. In fact I am going to be going back really soon. 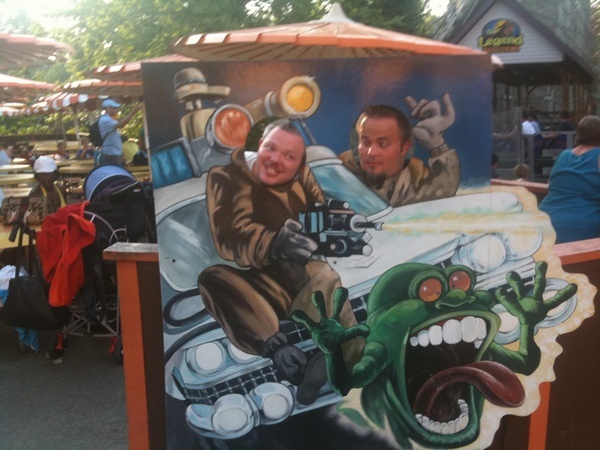 Below is a Picture of my cousin and I at Holiday World taken August 8, 2009.